My visit to Deepali’s was on the day I returned from an epic adventure in Portugal, and I was feeling – how can I put this? – a little delicate. So I was relieved to have somebody else to cook for me and further gratified to be in a quiet, comfortable environment and served by a friendly waiter. 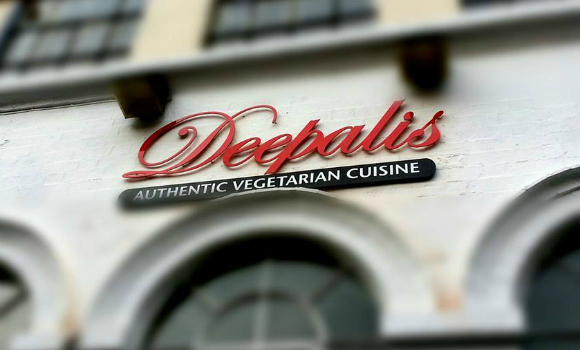 The menu at Deepali’s is 100% vegetarian with at least half marked as vegan, so there was plenty of choice and many tempting South Indian specialties. I went for one of the special recommendations, Gobhi Manchurian, which was an Indo-Chinese recipe of cauliflower florets pan-fried in a crunchy batter and coated in a mouth-watering sauce. It was delicious! I couldn’t fault my time there; the food was tasty and extremely good value and the service was prompt and courteous. Highly recommended.